A number of the cartoonists who had been publishing through Dan Nadel's PictureBox chose to go to Fantagraphics after Nadel shuttered his business. Given that their aesthetic interests were very closely aligned, this is a move that has made sense. 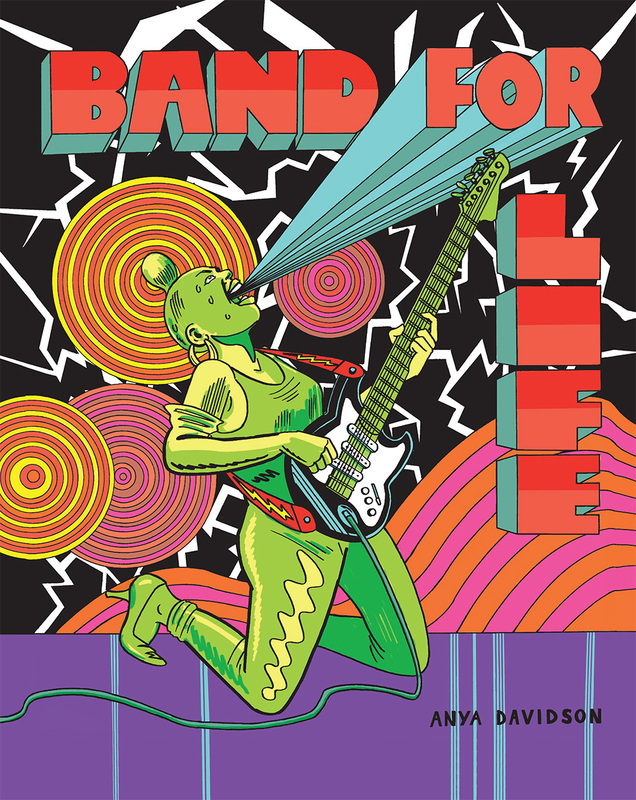 Foremost among the newer artists whose work first appeared with PictureBox is Anya Davidson, whose School Spirits was remarkable in the way it captured teenage friendships, psychedelic weirdness and rock 'n roll. In her new collection of strips, Band For Life, the essence of the book is not the scene or even the music (both of which are left intentionally vague) but rather the camaraderie of the band as it negotiates following one's aesthetic dreams with the realities of daily life as well as the kind of conflicts that can only occur in a highly emotionally charged environment like being in a band. With a style that's somewhere between Ted May and Pedro Bell (the artist behind the Funkadelic album covers), Davidson creates a world of lovable misfits, mutants and weirdos doing something they love. Davidson clearly has affection for all of her characters, flaws and all, and it's clear that she wants the reader to love them as well. It's a story of people wanting to be someone or somewhere other than where they are right now and how the possibilities that open up in the moment by playing in a band create a new kind of narrative. Davidson has a real talent for juggling multiple character-driven narratives all at once, and it's especially tricky in this story because characters from different narratives often overlap in surprising ways. Over the course of each two to three page episode, Davidson manages to provide equal time for character development for of the members of the band plus a number of the supporting characters as well. If the book has a flaw, it's that it ends right in the middle of an unresolved story. It would have actually been preferable to cut the book off a few pages earlier to give a more cohesive ending, and pick up again with a second volume at a more appropriate starting point. That's a quibble, because the reality is that I simply never wanted the book to end. There is a very slow-brewing overarching plotline, but what's more important are the day-to-day activities of the band Guntit, their problems, their love lives and the rare but always welcomed gigs. There's Linda, the fiery-tempered lead singer; Renato, the tattoo artist and guitarist who's had an unrequited crush on her for years; Krang, who at first lived in a junkyard and then moved in with his boyfriend; Zot, the sort of anthropomorphic dog who has a lot of family issues to deal with; and Annimal, the alcoholic drummer with young twin girls and a toxic ex-boyfriend who won't leave her alone. Annimal screws up on multiple occasions in big ways, but I found her to be the most interesting character by far. She's a mixture of crippling self-doubt and powerful self-expression, as she is constantly battling to try to be her best self and often loses. Unlike Linda, who's passionate but often a one-note character, Annimal veers between sobriety and blackouts, fierce freedom and codependence, and narcissism and empathy. Davidson's use of color and her truly strange character designs make every panel interesting to look at, which was a crucial strategy because in reality this book is a lot of talking heads. Davidson makes sure that some of the heads look like mutants and that they range from green to orange to purple. The lurid quality of the colors and the way she uses color dissonance to mimic the sonic dissonance of the band is clever. Nothing is too outrageous, and it's this part of the aesthetic that reminds me so much of Pedro Bell by way of the Archies. The Ted May influence refers to the glorious looseness of her line, reminiscent of May's high school heavy metal stories. Influences aside, the complexity of the character narratives are something that Davidson used to great effect in School Spirits and Lovers In The Garden, as the ripple effects from one set of characters carried over to others in interesting and unexpected ways. What's important to understand in the course of reading this book is that Davidson doesn't really seem to have an endgame in mind. Sure, the band goes through ups and downs as Renato is nearly killed by a mobster, Annimal gets kicked out of the band, the band starts writing songs and eventually records a demo that gets picked up by a small label. That's all part of the overarching story that I mentioned, but it takes over 250 pages just to get to this point of Guntit's story. Davidson seems way too invested in these characters, like in the way the Hernandez Brothers are invested in their characters, to want to wrap up their stories any time soon. The characters and situations in this book are malleable in such a way that Davidson can use them to tell any kind of story. She can pour on family drama, she can go for laughs, she can address political issues, she can comment on art and music and she can simply pair off different characters at different times just to see what might happen. 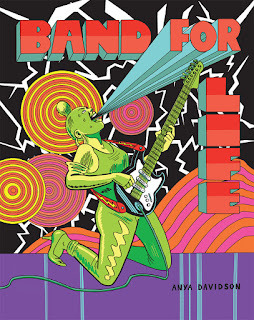 All of Davidson's work feels personal, but one senses that Band For Life goes even deeper. Like Charles Schulz and Peanuts, I don't think that any one character in particular is a Davidson stand-in, but rather each member of the cast perhaps represents a different aspect of her personality or is a stand-in for someone she knows. Davidson can be as sincere or as satirical as she wants, and the strip can stand up to those kinds of radical shifts in tone. That's because whatever tangent Davidson might lean into for a while, she always snaps back to the characters and their stories before long, keeping the reader engaged. I'm not sure she will keep this up as a life-long work, but these characters are bursting with the kind of ideas and energy that could be kept up indefinitely, providing new surprises along the way for both artist and reader alike.